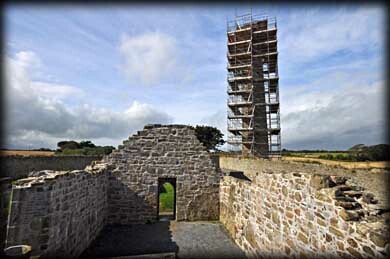 The round tower at Rattoo has always been regarded as one of the finest examples in the country. On our way back from Dingle we decided to take a detour so we could take in this tower and the castle at Listowel. 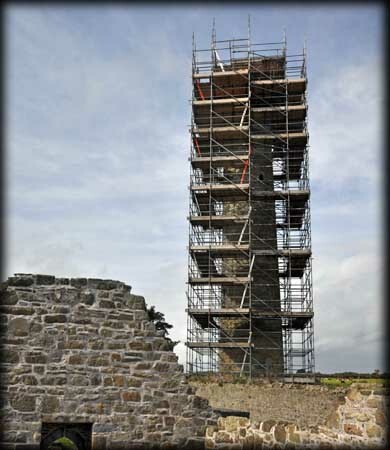 We could not believe our eyes as we approached the site - for the second time in 12 months we came across a round tower that was undergoing conservation work, Dysert Aenghusa being the first one. It is great to see this work taking place but it was quite disappointing for us. The tower is built of yellow sandstone and stands just over 27 metres tall. There is a 20 cm offset at the base set upon a limestone plinth. Two thirds of the conical cap was replaced in 1880-81. During the restoration works a sheela-na-gig was discovered on the inner face of the north window. It is the only sheela associated with a round tower. The arched doorway stands 2.83 metres above ground level. 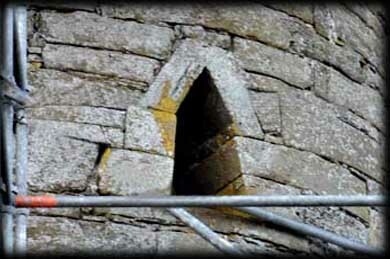 A rounded moulding follows the arch of the doorway, with some decoration on top of the moulding above the doorway. We are not sure when the conservation work will be completed. Situated: From Ballyduff in North Kerry head south on the R551 for 1.1 kilometres. Turn left (signposted Rattoo Round Tower). Go to the very end of this road. Discovery Map 71: Q 8780 3362. Last visit Sept 2012. 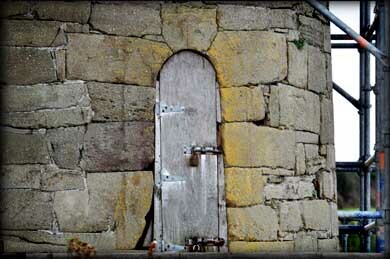 Door: Above ground 2.83m. Type: Three stone arch. Features: Sheela na gig on belfry storey.